In its report, Separate and Unequal, Human Rights Watch states that, "discriminatory Israeli policies control many aspects of the day-to-day life of Palestinians who live under exclusive Israeli control and that those policies often have no conceivable security justification." These discriminatory practices are at the heart of many of the "counter-terrorism" practices that MPD officials seek to learn from in Israel. In September, 2017, First District Commander Morgan Kane participated in a police exchange sponsored by the Anti-Defamation League (ADL). The MPD has not fulfilled a FOIA request for the itinerary from Commander Kane's trip, but understanding the discriminatory practices employed at locations exchange participants typically visit makes clear the lessons being taught. Hebron is a Palestinian city in the occupied West Bank. Amidst the 200,000 Palestinians in Hebron live about 750 extremist Jewish settlers, guarded by 1,500 Israeli border police and soldiers. According to the Israeli human rights organization B'Tselem, Palestinians living in the area are subjected to extreme restrictions on their movement – including the closure of main streets – while settlers are free to go where they wish. In addition, the military has shutdown hundreds of Palestinian stores and commercial establishments in the area. At a checkpoint in Hebron, police point guns at children as the make their way to school. Over the years, systematic abuse and harassment of Palestinians by settlers has become an established part of life in Hebron. Soldiers are to be found on every street corner wherever there are Israeli settlements. Nevertheless, soldiers and police rarely intervene when settlers attack Palestinians. Even after the fact, the Israel Police hardly ever investigate settler assaults against Palestinians or their property – in spite of the many security cameras crisscrossing the city – and very seldom take action against the perpetrators. This is tantamount to the police backing the settlers’ acts of violence. Border police in Hebron confronted for illegal arrests of Palestinian children. Under protection of Israeli border police, settlers take over Palestinian home. Police threaten little girl and take her bicycle. 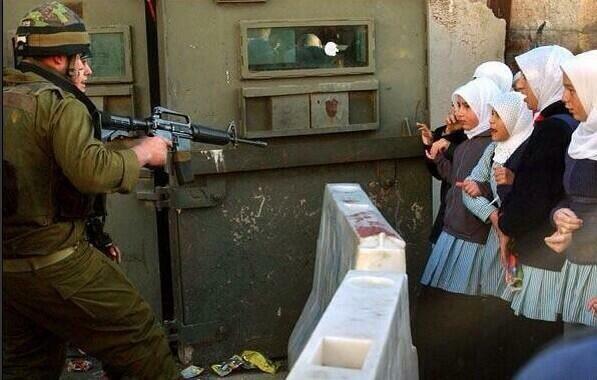 Soldiers harass teachers and school children. Soldiers drag 8-year old from home to home looking for stone throwers. Settlers throw rocks at Palestinian homes while soldiers look on. On exchange trips, MPD officers typically visit a prison, where they are told about the incarceration of terrorists. What they are not told is that these prisons are part of a separate and unequal legal system of military law. Palestinians in the occupied territories are brought exclusively before military courts that have a nearly 100% conviction rate. The Association For Civil Rights in Israel describes this as the institutionalized regime of two separate legal systems, based on a ethnic and national origin. Banning Palestinians from assembly of 10 or more people for a political purpose. Display of flags or emblems and the publication of documents or images with significant political content. Verbal or other expressions of support for activities deemed illegal under military orders. This includes many political parties and student unions. Anyone breeching Military Order 101 faces imprisonment for up to 10 years and/or a hefty fine. Administrative detention poster issued by the Middle East Monitor. As of February 2018, 450 Palestinians are currently being held under administrative detention, according to Addameer, the Prisoner Support and Human Rights Committee. Addameer' video calling for end to administrative detention. Amnesty International: Israel must end unlawful and cruel policies toward Palestinian prisoners. 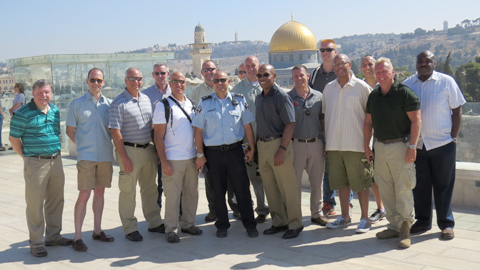 U.S. law enforcement officials participating in ADL Police Exchange in Jerusalem. When MPD officials participate in police exchanges, they meet with police and security officials in Jerusalem. The Israel National Police has jurisdiction over around 300,000 Palestinian permanent residents of the occupied Eastern half of the city. There, American officers see policing practices such as the extensive and discriminatory mass surveillance of Muslims and Arabs. In East Jerusalem, the Israeli National Police has used water cannons to spray Palestinian homes and schools with a putrid chemical called Skunk. These indiscriminate attacks are a form of collective punishment. Video taken of these police attacks show neighborhoods were being sprayed when there was no evidence of clashes in the area. Israeli National Police use water cannons to douse protesters with putrid skunk spray. Mistral, Inc., a Bethesda-based company, is now importing Skunk Spray from Israel and marketing it to U.S. police departments. In a marketing video, Mistral promotes Skunk as a non-lethal weapon that is designed to meet the requirements of law enforcement and military agencies that are challenged with intervening during demonstrations or passive civil disobedience. B'Tselem interviewed about the use of Skunk Spray. B'Tselem: Home Demolition as Collective Punishment.